An optical sensor has been developed for high acidic values based on immobilization of 1,3-bisdicyanovinylindane (BC) on a triacetylcellulose membrane. The sensor exhibited fast color change from colorless to deep blue while changing the pH in high acidic region. The immobilized BC showed a broader dynamic range (1.3 pH units) with respect to free form (0.8 pH units). The sensor response was fully reversible and fast (<20 s) under the batch conditions with pH between 0.5 and 2.3. 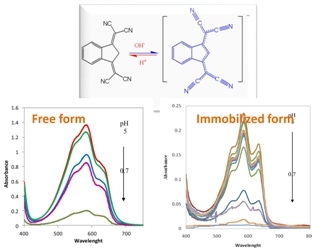 The Ka values for free and immobilized dye were evaluated and the chemical reactivity of the BC in solution and after immobilization is also described.